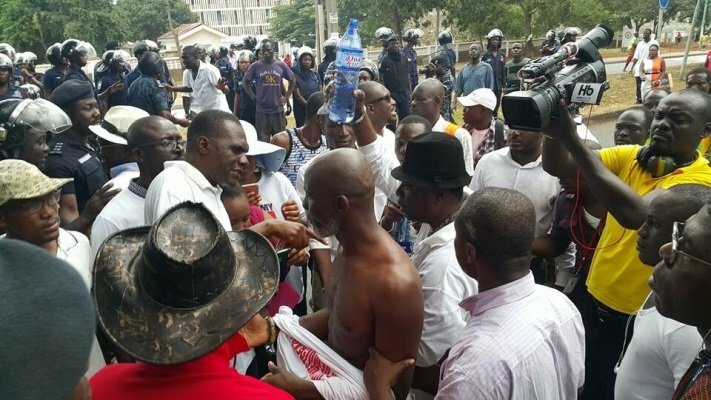 The opposition New Patriotic Party (NPP) wants an independent investigation into police brutality during last Wednesday’s Let My Vote Count Alliance demonstration . In a statement, the party said an independent and neutral body, i.e. a Commission of Inquiry, is the best chance to secure findings that would help the police in their future conduct, “and the nation in our forward march in democratic, civil governance”. Nana Addo Dankwa Akufo-Addo, the NPP’s 2016 presidential candidate, on Thursday, September 17, at Bolgatanga, expressed regret at the conduct of the Ghana Police Service during the September 16 demonstration in Accra. He described events of the day, which saw police officers use excessive force on unarmed protestors, as a great shame on our country, and a drawback on Ghana’s forward march in democratic governance. Nana Akufo-Addo called on President Mahama to set up an investigation into the events of Wednesday, particularly into the conduct of the police, as a first step to secure more professional police methods in future. President Mahama, on Saturday, September 19, at Ho, also expressed regret at the conduct of the Ghana police during Wednesday’s demonstration. The president, in a move that underscores Nana Akufo-Addo’s concern, disclosed he had urged the police to Institute a probe, to review the police’s conduct during the Wednesday demonstration. The NPP applauds the president for joining the large chorus of condemnations of the police brutality against the demonstrators. The NPP is particularly pleased at the president’s endorsement of the call for a probe into the unfortunate events of last Wednesday. However, the NPP believes a police administration internal probe into the police’s own conduct, as directed by the President, would not achieve the desired result of a timely, impartial, objective and thoroughgoing investigation into Wednesday’s unfortunate events. The conduct of the police is the major subject of the investigation. Impartiality, objectivity and transparency, essential ingredients for credibility of any investigation, will come under great strain if the police themselves were to conduct this investigation. The basis for this conclusion is simple: the police themselves, in various public comments by high ranking officers, have applauded and endorsed their conduct during last Wednesday ‘s demonstration. Having already given judgment on their conduct, it would be too much to expect them to conduct an impartial, objective investigation and transparent, devoid of prejudice. The NPP therefore reiterates Nana Akufo-Addo’s call on the president to institute the investigation by an independent and neutral body, i.e. a Commission of Inquiry, as the best chance to secure findings that would help the police in their future conduct, and the nation in our forward march in democratic, civil governance.